Full-on rugby at the Angels home pitch, Heaven, yesterday as the hosts cemented their first-seed status in the upcoming high school playoffs with comprehensive 43-3 victory over the Platte Valley, Conifer and Evergreen amalgam, PAC Rugby. 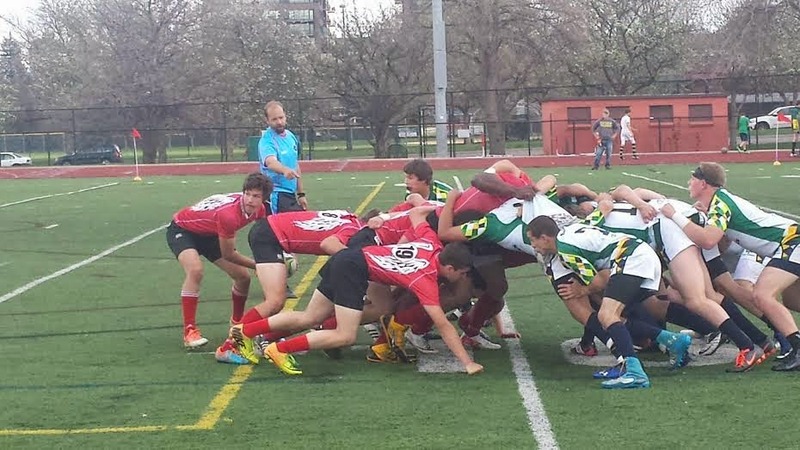 With a spring snowstorm’s bounty aground on Friday the match, originally scheduled as the curtain-raiser for Denver Harlequins full day of sport at Cook Park Rugby Grounds, was shifted to East’s homeground all-weather pitch to ensure the play. PAC roared out of the blocks at kickoff, winning ball at their own ten meter line as the traveler’s flyhalf, Davis Price, sliced to space for a fast forty and PAC were on the edge of the Angels business district with the set piece put, looking very much the picture of rugby commerce in the contest’s early stages. An East yellow ticket for dangerous play/high tackle issued as such by field judge Stu Geiger, a surely struck penalty fired by Price just outside the 22 and the visitors as leaders, 3-nil, in the 5th minute of action. Though a man down, Angels mounted an attack from the PAC ten-meter line that caught the visitors scrambling in defense, but a corner rounding by inside center Lorenzo Harris had that speedster into space to outpace the chase to goal; with the Harris try converted by sizable scrumhalf, Chris Musselman, East commanded the lead at 7-3 in the 11th minute. Crashing, bashing action from the breakdown on each side with first channel incursions and slings out to the three-quartersline, but East now with the better handle on an intemperate pill and PAC experiencing the bane of all forward movement, the knock-on, with maddening regularity just now. PAC on the big attack on the edge of the East business district, its recycle by halfback Nathan Myer servicing an active, hungry backline. But ball spilled forward at tackle was scooped by East flyer, DJ Randolph, and ninety meters later the second homeside touch down of the day by that rapid runner; the added deuce by Mussleman and 14-3 the tallies with 22 gone off Geiger’s counter. Much action, yet no further scoring in the initial half. The East speedy recycle from breakdown, enabled by Denver Barbarians legacy Musselman, had their guest’s defense looking somewhat ragged on its rear leg at times, while PAC its own non-friend with ball handling errors in its three-quartersline negating hard-won territorial gains. Denver resumed scoring shortly after the restart as a five-meter penalty fired out to the backline had replacement outside center, Yanni Stavropolous, through the gap and dotting for Musselman’s conversion and 21-3 for the host, two minutes into the second stanza. Musselman slotted a penalty from 35 meters out to increase the East advantage to 24-3 in the 12th minute of the last half. Now PAC mounting a fine-looking forward maneuver, mixing tight-channel industry from out the loose with inside back communication, but a forward pass halted the surge and reversed possession. The Angels with the rapture as second center-turned-standoff for the day, Adam Leonard, grounded a brace of trys within a three-minute interval - one completed by Musselman – and 36-3 the numbers now with grim dour settling on the travelers in the 24th minute of the second half. East would see a final try by relief front row, Joshua Ruiz, and its conversion by Musselman before Geiger’s last blast and 43-3 the record to the Angels history now.